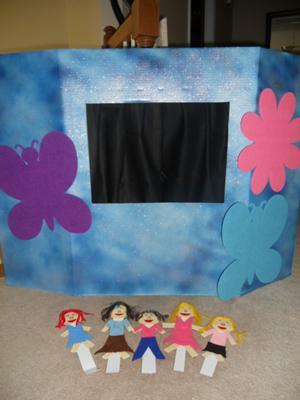 I had such a great time making my play therapy puppets and puppet theater. I took advice and used a project 3-fold poster board and spray painted it blue and then sprayed glitter over it. I found the big cut outs and placed them on the front as well. 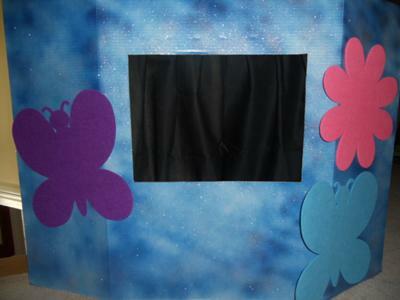 I went with a black curtain because you want to be able to concentrate on the puppets. 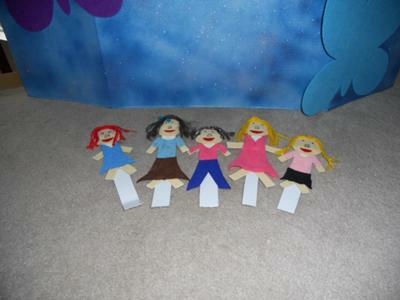 My puppets are 4 middle schoolers and a mom. From left to right there are: Lindsay, Ashley's mom, Ashley, Bridgett, and Bridgett's friend. The script was what I found the most troubling. I started to think of situations that would relate to young children and went with a 'bully' theme. I think that is a important thing to teach children.